Wrap the_content and the_excerpt in AMP stack source comments to reveal which filters are responsible for the resulting content, since not any one filter callback can be identified as the culprit for invalid content. Remove spurious apostrophe from callback class name. Prevent PHP notice when doing summarize_validation_errors if a source has no type or name. This will greatly help with debugging AMP validation errors related to filters, where previously there was only good validation debugging for actions. * Wrap the_content and the_excerpt in AMP stack source comments to reveal which filters are responsible for the resulting content, since not any one filter callback can be identified as the culprit for invalid content. * Remove spurious apostrophe from callback class name. * Prevent PHP notice when doing summarize_validation_errors if a source has no type or name. This looks good. 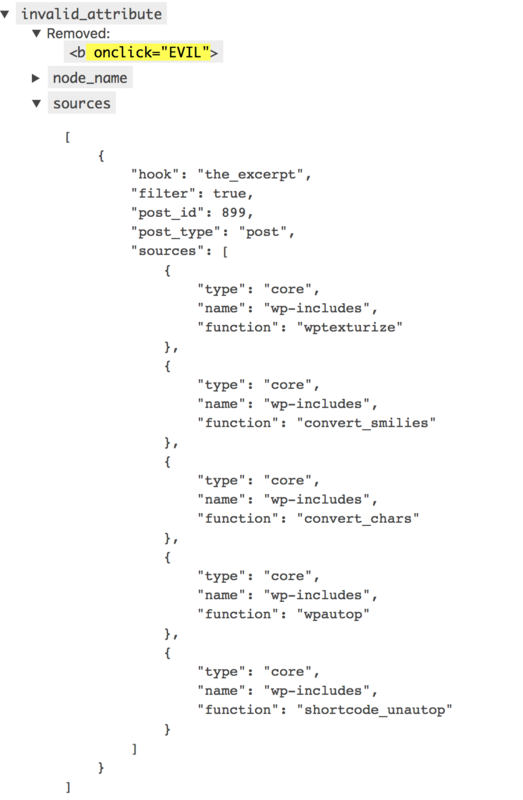 It's nice how it has a stack trace of the filter.